Amazon | For the first time the lay public can benefit from the anti-aging secrets discovered by the Life Extension Foundation, the world’s largest, most respected organization dedicated to anti-aging research. Working with the Life Extension Foundation, renowned anti-aging physician Philip Lee Miller shows you how to retain your physical health and vigor, mental clarity, and youthful appearance — for life. This far-reaching anti-aging program will change your life forever. Like many of Dr. Miller’s patients, your physical and mental health will actually soar as you age chronologically. 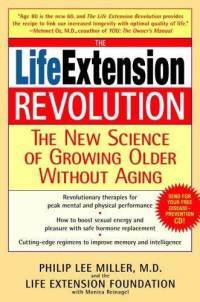 Your new longer, healthier life begins now as you embark on The Life Extension Revolution.